A. 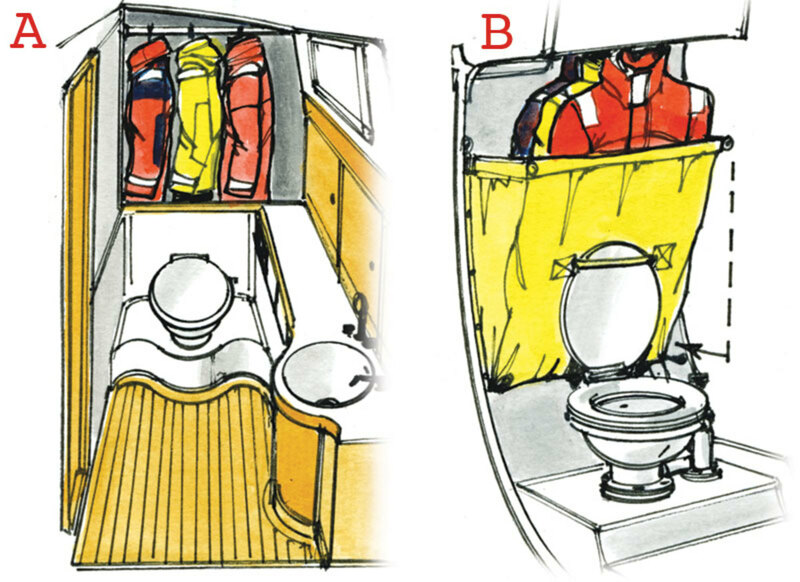 Some boats have room for a wet locker to be partitioned off in a head and/or shower compartment.B. On a smaller boat, a PVC bag with drains in it mounted above the toilet can work. You can clip the bottom of the bag back out of the way when using the toilet. 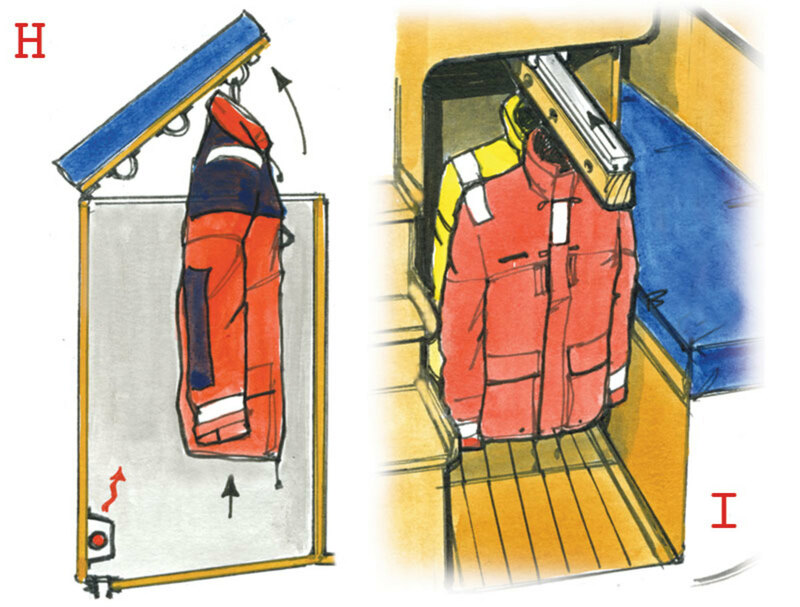 C. Sometimes a small drained locker with side access can be built in under a boat’s bridgedeck. An opening port into the cockpit lets in light and air while heat from the engine warms it.D. A hanging rod above the sink in the head will work, but be sure to guard against chafe.E. Some bluewater boats have room for a sit-in bath, which is great for washing and doing laundry and can also serve as a drip tray for foulies. F. Boots can be stowed on wooden pole racks under wet foulies.G. If you can’t fit in coat hangers, try hanging wet gear on carabiners or line toggles. H. This locker is built under a seat in a wheelhouse; as you lift the seat, the foulies are raised up into view. It drains on both tacks and has a small heater protected by a stainless steel grill. Some fabrics don’t like too much heat, but blown warm air seems to work well.I. This long rail pulls out on a strong track and foul-weather gear can be hung on coat-hangers threaded through holes. A few extra hooks are used for life jackets, harnesses and net bags for gloves, etc. It slides back into a vented space, which is warmed by the engine and drains into the bilge. It makes good use of that awkward space beside the quarterberth.